How may we find new and engaging solutions for access to, and the application of, digital photo archives? Digitized collections continue to be relatively unused and unexploited, despite formidable investments over several decades. Innovation in design and implementation could open the way to a plethora of new techniques for the display and dissemination of digitized resources. 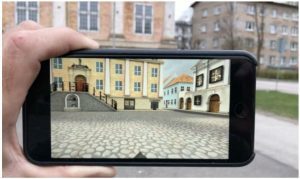 In this project, we have explored some new and valuable techniques to enhance use of digitized historical photographs by combining (mobile) Augmented Reality (AR) with elements of gameplay (gamification). To make the design practical, we drew from features found in common ‘analogue’ games such as the jigsaw puzzle and the ‘Hot & Cold’ game. 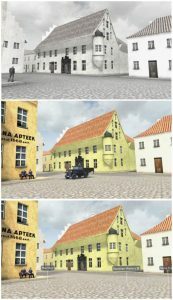 In addition to this experimental design for a ‘Photo Positioning Puzzle’, the application includes a dynamic 3D–reconstruction of an historic city square (Raekoja Plats in Old Narva, Estonia), as well as an information layer for access to background information, including additional historical photos and online resources. The system has been tested and assessed by users on location. Our conclusion is that the ‘Photo Positioning Puzzle’ with its mobile AR functionality was very successful. As a new potential genre it should have general value and suitability for additional historical places with corresponding photo collections and archived documentation. Illustration 1. Top: The Town Hall square (Raekoja Plats) today, looking west. The still prominent Town Hall is flanked by Soviet apartment buildings in the ‘Khrushchyovka’ style, which now completely dominates what used to be Old Narva. Middle: A photo from the ca 1930s showing a close up of the same view. The north–east corner of the Town Hall is visible in the left part of the image and one can see a row of the old baroque buildings that once encompassed the square, before the destruction. Bottom: A rephoto (now & then) montage of the two images. (Photos: Google Maps Street View and . Illustration 2. The Narva application in use on location with the device oriented towards the north–west and showing mode B, the reconstruction of everyday life in the 1930s. The user is here positioned very close to the vantage point of the historical photo seen in fig. 1. The wide angle lens of the virtual camera depicting the 3D reconstructed environment shown on the iPhone’s screen has a smaller focal length than the lens of the physical camera recording the application is use. As a consequence, more of the Town Hall building is visible on the screen than in the real image. 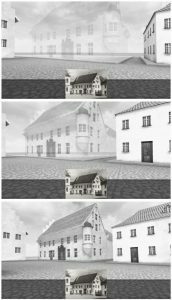 Nevertheless, the north–east corner of the real Town Hall building is rather well aligned with the same corner in the digital reconstruction. Photo: G. Liestøl. Illustration 3. 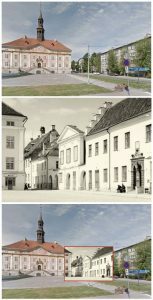 Top: Five of the photos have been positioned and only one remains, the one showing the Hans Fonne’s house at the north–east corner of the square. The user is still a good distance from the vantage point since the transparency of the building is about 70%. By comparing this with the real photo at the bottom of the screen (shot) the user is also positioned too far to the north (left) of the target area. Middle: The user is now closer to the vantage point judged both by the more opaque model and the better angle. Bottom: The user is now close to the vantage point given that the transparency is less than 10% and the angle is almost correct. Only a little more distance is needed before the vantage point (area) is found and the model of the Town Hall square is complete. Screenshots from the Old Narva application. Illustration 4. A top–down view of the digitally reconstructed square. 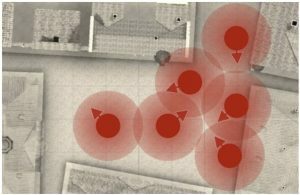 Solid red dots indicate the vantage point area (r = 5 m) for each of the six photos, while the larger circles with gradient transparency indicate the area where 3D-models of the buildings depicted in the photo are (more or less) transparent. The arrows mark the orientation (perspective) of each photo position. It was important to make sure that photos with a vantage point closer that 10 m apart were not selected. Illustration 5. Like in the jigsaw puzzle the photo positioning player (visitor to the site) must analyse the visual relationships between the photo ‘pieces’. However, the exact joining of the physical pieces in the jigsaw puzzle is replaced by the horizontal overlap between the photos. Here represented by three of them and with the shared information parts marked in red. Illustration 6. Top: The photo puzzle has just been completed and the full colour of the reconstruction is fading in. Gradually, people, automobiles, horse–drawn carts etc. emerge in the scene. Middle: The scene has transformed into full colour and a truck is crossing the square. Bottom: By touching the screen all animation is paused and time freezes and the information layer is activated. It is now possible to walk up to spatially positioned hypertext links and access background information such as history, use of buildings, famous events, architecture etc. Screenshots from the Old Narva application. Illustraton 7. The spatially positioned hypertext link ‘Destruction of Narva’ has been activated in and the PDF document describing the destruction displays a photo from after the bombing of the buildings just north of the Town Hall (almost the same orientation as in illustration 2). Photo: G. Liestøl. 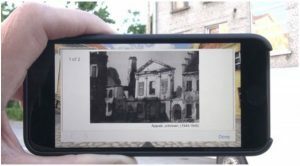 A large number of the photos from Old Narva can be found in the exemplary online photo database Ajapaik , a crowdsourcing platform for geotagging and rephotography of historical images.